Try ScheduleAnywhere free for a month. It's easy, affordable and proven. Used by over 27,000 managers! 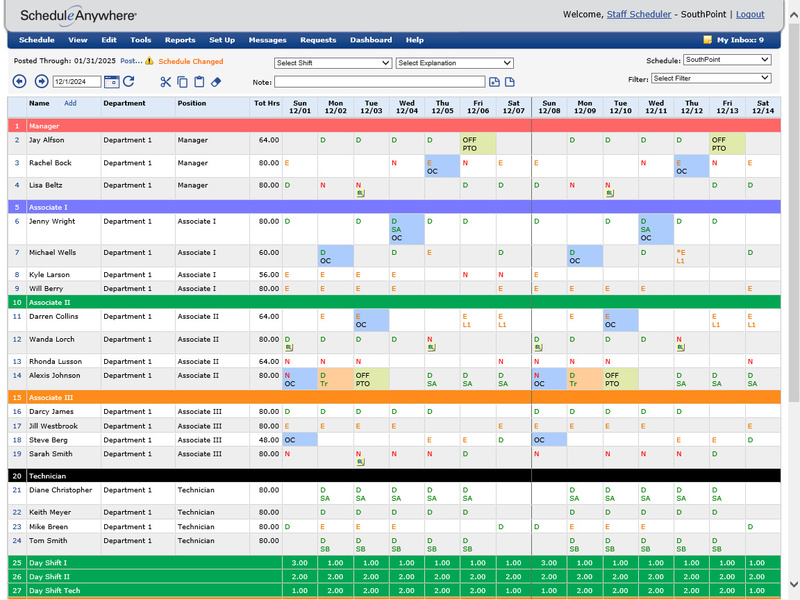 ScheduleAnywhere has scheduled over 380,000 employees and 58 million shifts. Why switch to the #1 employee scheduling software? Cut employee scheduling time by up to 75%. 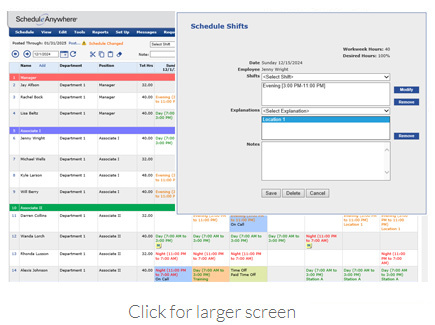 Schedule your staff in seconds and communicate staff schedules online. Spend less time scheduling and have more time for other tasks. Need to fill an open shift or tell your staff about an important upcoming event? In seconds, send employees text and email messages. No more wasting time trying to reach your staff by phone. View work schedules from any computer or device with Internet access. Our free mobile app and mobile site are great for employees or managers who need access to work schedules on-the-go. 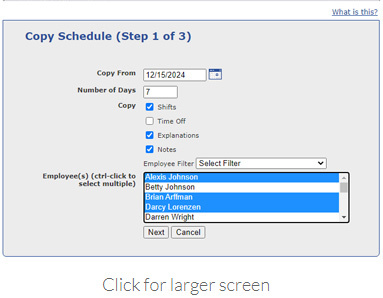 Our employee scheduling software's built-in tools help make sure staffing requirements are met. Whether it’s by shift, position, department, location, or skill, you’ll have the peace of mind you’re properly staffed. 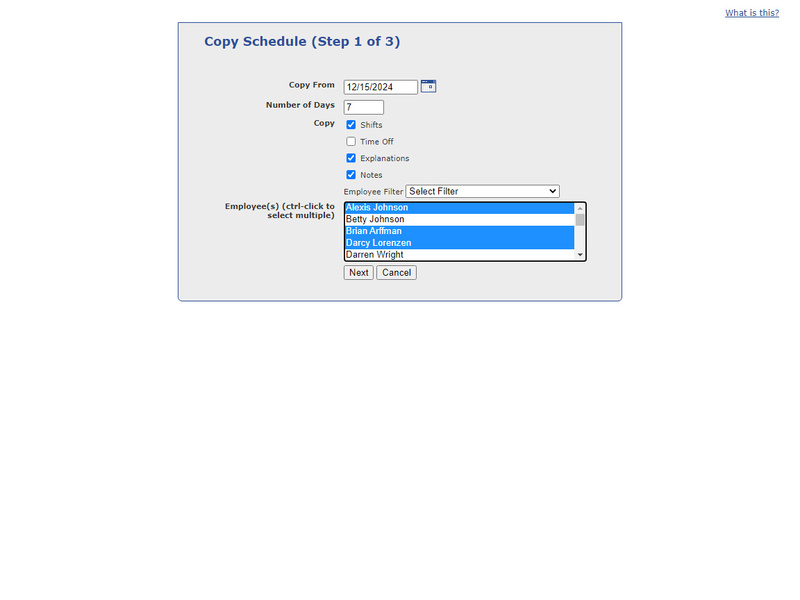 Copy schedule rotations quickly and easily. With just a few clicks, you can copy shift and time off patterns, as well as staffing requirements, effortlessly into the future. Get the employee scheduling software that costs just pennies a day per employee. Not only is our software budget-friendly, but it will help reduce unnecessary overtime by up to 90% and pay for itself. 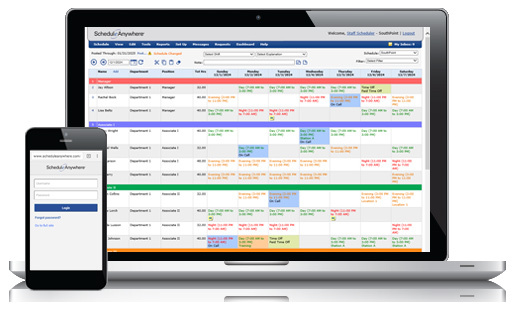 Save time and money with the industry-leading online scheduling software for over 20 years. 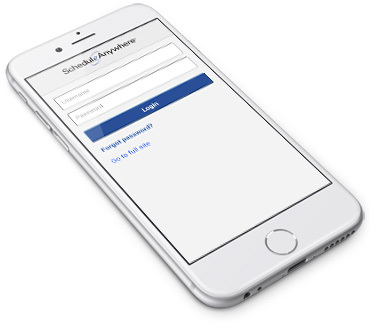 ScheduleAnywhere is the #1 online employee scheduling software for managing employee schedules. Connect employees instantly to their work schedules with our free employee scheduling app. Now your employees will always know when and where they work. Ensure proper staffing and streamline communication with online vacation time tracking. Make it easy for your staff to request time off and easy for you to manage it. Switch to the affordable staff scheduling software that makes employee scheduling fast and easy. 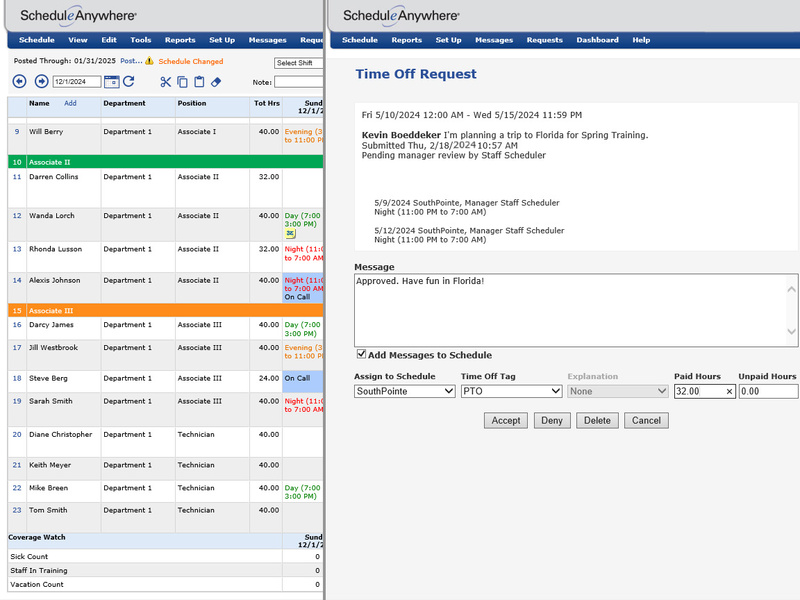 ScheduleAnywhere is easy to use and will make your staff happy. 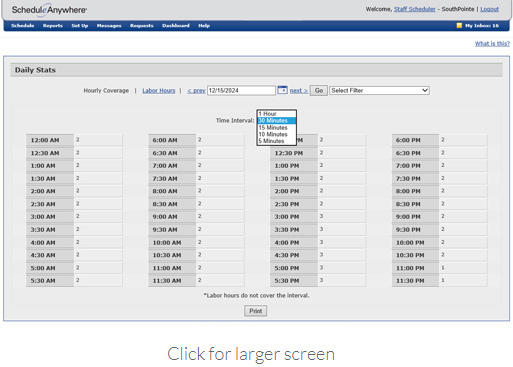 Create staff schedules that work for your business and its employees with our online schedule maker. It will save you time and simplify the tedious task of employee scheduling. 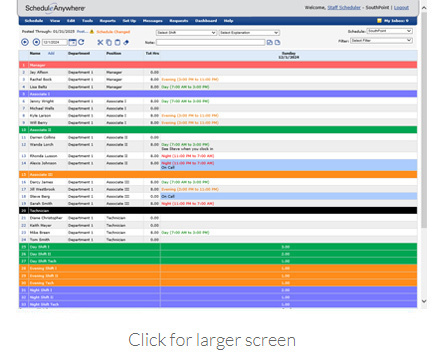 Build your schedules in advance to make shift planning fast and easy. 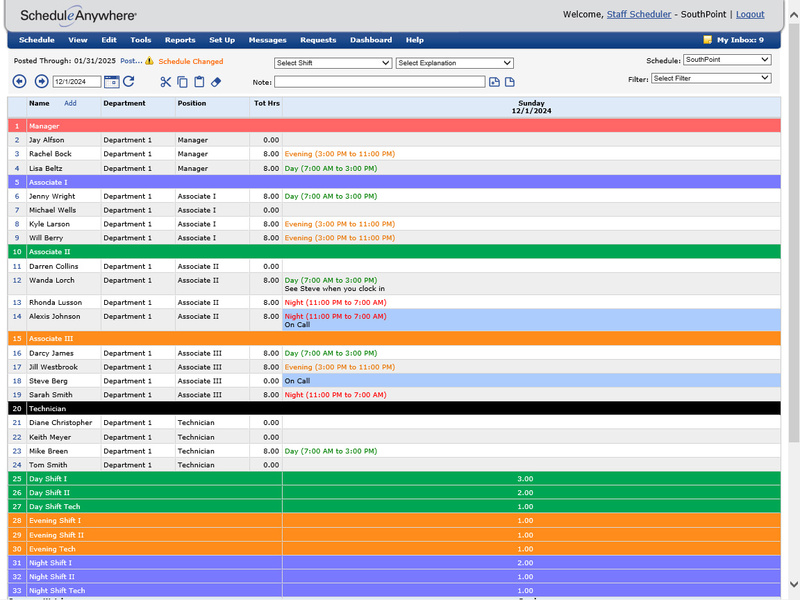 ScheduleAnywhere includes everything you’ll need to effectively plan and communicate shift schedules. to your staff. Automate staff scheduling with our online work scheduling software by copying schedule templates as far into the future as you want. 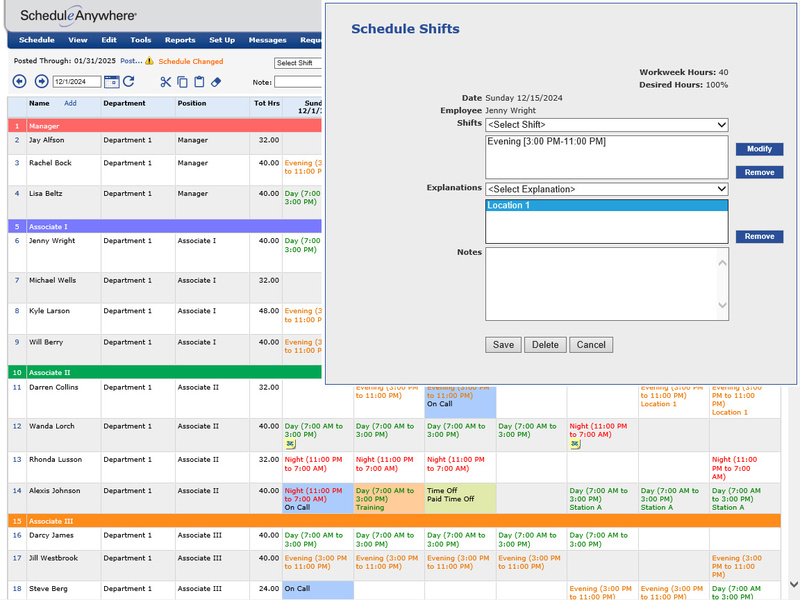 Assign shift schedules and rotations in seconds so you can spend more time on other important tasks. 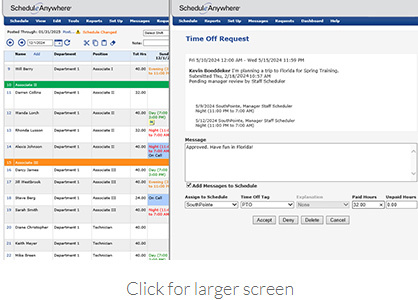 Build and communicate employee work schedules online with ScheduleAnywhere! Get the best online employee scheduling software for assigning and managing work schedules. 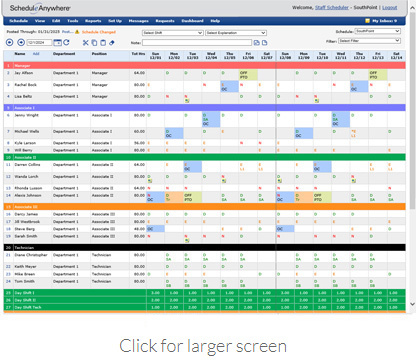 "ScheduleAnywhere provides efficiency, transparency, and cost savings at all levels. We explored many options for scheduling and this product, by far, surpassed its competitors and was the easiest to use." "Using ScheduleAnywhere has improved our ability to be more efficient and effective for our day-to-day operations and during times when we need information quickly." 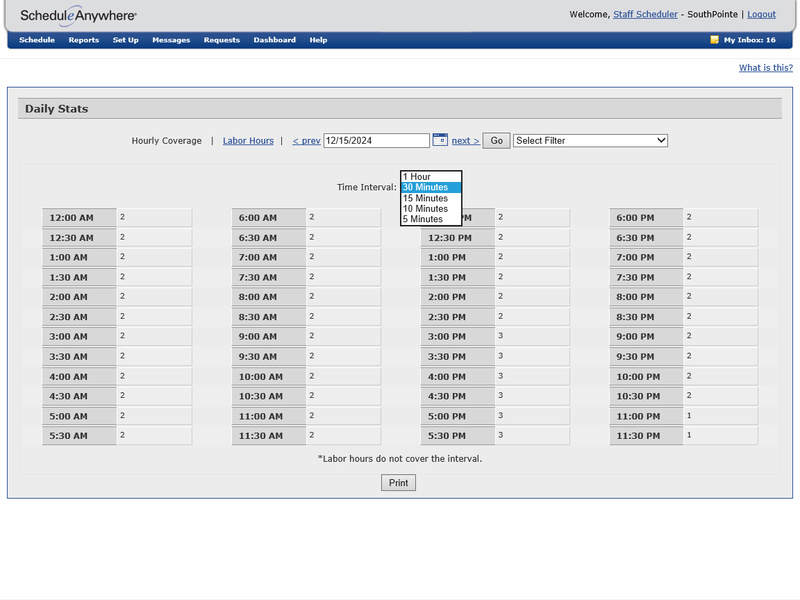 "ScheduleAnywhere helps us fill any coverage gaps ahead of time, which helps control our overtime costs. It has dramatically reduced the amount of time it takes our managers to create and maintain schedules." 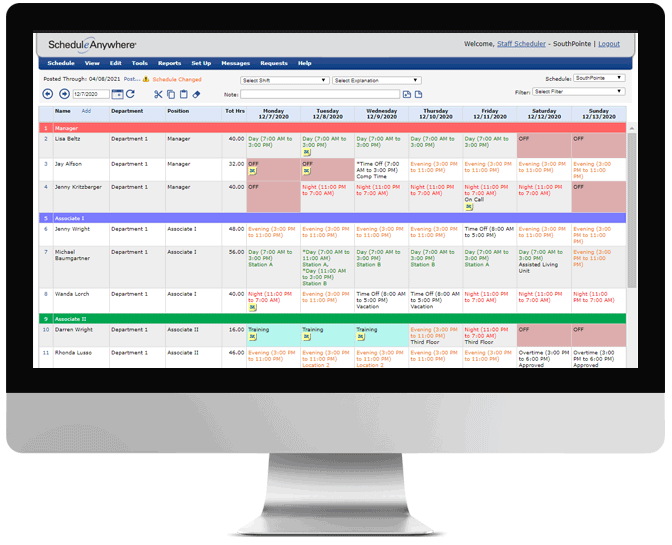 ScheduleAnywhere is the #1 online employee scheduling software from Atlas Business Solutions, the leader in employee scheduling software for over two decades. We have the scheduling software technology, track record, and experience to save you time and money. Try ScheduleAnywhere today! Easy. Affordable. Proven.